Prominent indigenes of Kwara State, on Tuesday, gave their views about the allegations made against Senate President Bukola Saraki by suspects arrested by Nigeria Police over the April 5 Offa bank robberies, in which about 30 persons were killed, among whom were nine policemen. Recall that the Police had initially invited Saraki for interrogation before asking him to provide only a written explanation within 48 hours. Also linked to the bloody robbery incident is Governor Abdulfatah Ahmed of Kwara State, following alleged claims by the suspects that they were political thugs working for the duo. But Saraki and Ahmed had both dismissed the allegations as an attempt to frame them. Here are the respondents opinions in separate interviews in Ilorin. The Tafida of Ilorin, Dr. Amuda Aluko, said it would be better for Saraki to respond to the Police in order to clear his name. Aluko, who maintained that Saraki could never be involved in robbery, however, said it had become imperative for him to clear his name since he was allegedly mentioned by the suspects. He said that his Kwara Liberation Group had, about a week ago, urged Nigerians to allow the Police to do their job. According to him, the claim by the suspects that they had links with Saraki makes it imperative that Saraki avails himself of the opportunity offered by the Police to clear his name. Prof . Abdulwahab Egbewole of the Department of Law, University of Ilorin, on his part, warned against “the politicisation of the lives of Nigerians.’’ Noting that the Police have the right by law to investigate everybody. The PDP Chairman in Kwara State, Akogun Iyiola Oyedepo, urged the Police to do thorough investigation into the Offa robbery incident. He also expressed doubts that the Senate President would support the suspects to engage in robbery. Oyedepo, however, said Saraki has a moral duty to clear his name. He advised the Senate President to honour the Police request by sending his statement so as to clear his name. “Did Saraki give them vehicle? Did Saraki provide them guns? Are they his political thugs? “All these questions should be answered by Senator Bukola Saraki to clear his name,” Oyedepo counselled. He called on the people of the state to rise up and demand justice so that the case would not be compromised. In his reaction, the State Secretary of the National Union of Local Government Employers, Rafiu Hotonu, said there was nothing wrong with the Police request asking Saraki to respond to allegations. “He should honour the request to clear his name. NULGE wholeheartedly supports the Police because the suspects allegedly confessed that they work for the Senate President, so he needs to clear his name. “No matter how highly placed you are in the society, once the Police invite you, you are bound to honour the invitation,” Hotonu said. 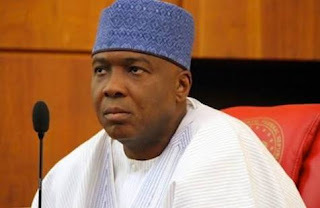 An Ilorin based legal practitioner, Mr. Isaac Oladele, said there was no crime in a Police invitation, urging Saraki to use the opportunity to respond to the allegations. Oladele, who noted that the Police had even said the Senate President needed not appear in person, adding that it “is an opportunity for Saraki to clear his name of all the allegations of sponsoring cultists as thugs and having a link to the Offa robbery. However, another lawyer, Mr. Tunde Jimoh, appealed to the public to “stop politicising the matter” but to allow the Police to conduct their investigation. “Nigerians must allow the police to do a thorough finding. They must stop the different protests and distractions on social media. “Enough of interference from the external forces; there is no need to mount pressure on the Senate President and the Nigeria Police in order not to complicate the matter. “The fact that the suspected robbers mentioned Saraki’s name in their confessional statements doesn’t mean we should jump to conclusions. “Nigerians must be patient and give room for thorough investigation and fair hearing, rather than drawing conclusions, ” he said. “It is still an allegation for now, and he is not yet found guilty. The best for him (Saraki) is to honorably make his statement on the matter available before it turns to another thing. “If there is the need for him to step down from his post as Senate President to clear his name, he can do so for the sake of his integrity and that of the National Assembly,” Aina opined.